FRANCIS SHAW (b.1942): Piano Concertos Nos, 1 and 2. Description: Shaw has written extensively for film and television, but has composed in a wide range of genres and, not untypically of composers whose main output is in the field of popular arts and entertainment, his 'serious' or concert output explores sophisticated modern idioms. Thus the First Concerto is a serial work, though not in the strict sense, and its ambiguous, highly chromatic tonality remains tonality of a rather extended sort. This is especially true of the slow movement, a beguiling slow blues, authentic and Gershwinesque but harmonically restless. The complex, discursive first movement and emphatic, somewhat Prokofiev-like toccata-finale, with suggestions of rondo-form establish this as a work of considerable originality within the traditional form. The Second Concerto, likewise in traditional three-movement layout, is larger in scale and orchestral forces. The work adheres to tonal centers more markedly than the first, though still with a good measure of ambiguity. The first movement is very varied in texture and expression, the tension gradually ratcheted up as the music progresses. The slow movement is a set of seven variations on a sombre, long-breathed theme. Prokofiev is clearly suggested both by the form (as in his 3rd Concerto) and aspects of the piano writing. The motoric finale also recalls Prokofiev, though the music takes a turn in a jazzy direction before resuming its powerful and determined progress toward a thunderous conclusion. 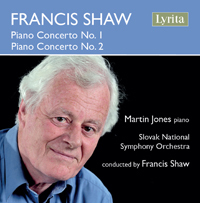 Martin Jones (piano), Slovak National Symphony Orchestra; Francis Shaw.